Some people will go to great lengths to help animals - and heights. 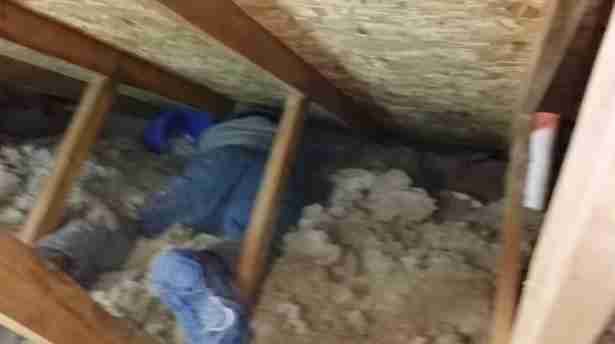 A video uploaded to YouTube in late October shows a man crawling up through the dust and insulation into the roof from his attic. "Alright we're going in," he says, and dives into the filthy fluff. After a few moments in the crevice he reports back to the cameraman, "Alright, I think we got 'em all." He emerges with a blue bucket. "Alright, let's see what we've got." The babies, who are so young their eyes are still closed and their umbilical cords are still attached, were assumed to be orphaned since the mother was nowhere in sight. So the men who would go to great heights for the good of animals rushed them to a rehabilitation center. "Another successful rescue," the man, still a little dusty, concludes. Learn what to do if raccoons are squatting in your house here.